Have you ever watched a movie where a drug or a bomb detection dog was performing a search looking for what he was trained for? 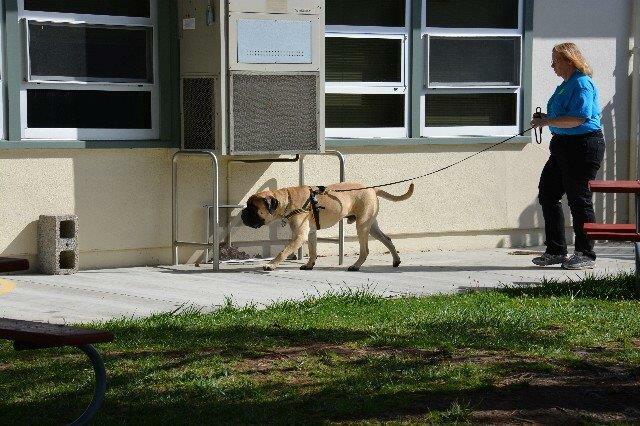 What if your pet or champion Bullmastiff could do the same? Well, minus the illegal drugs and dangerous explosives of course! 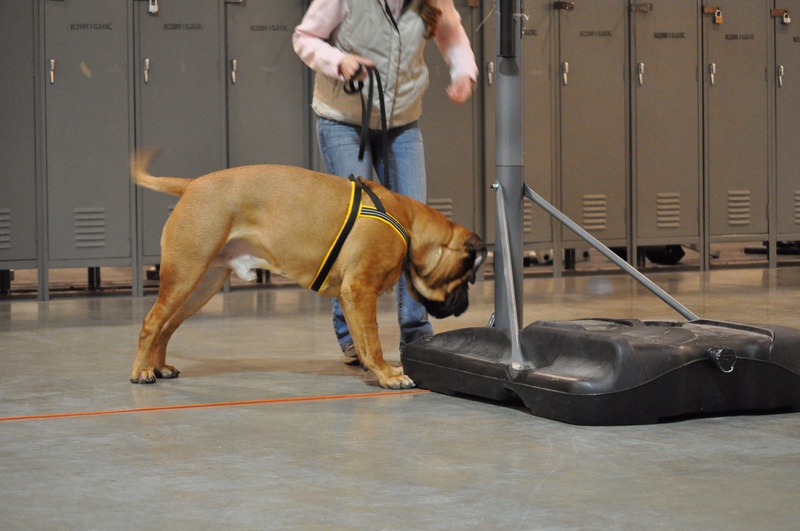 The sport of K-9 Nosework is quickly gaining popularity in the dog owner community. It is similar to what police K-9 teams do on regular basis. Every dog has an excellent sense of smell, and training your Bullmastiff is easy because it always involves lots of treats and positive reinforcement. Unlike in other dog sport competitions, treat rewards are not only allowed but you can say, almost required. Here are the basics… There are 4 element searches in a Nosework trial. 2) Interior – room (or multiple rooms in higher levels) that could be a classroom, warehouse, etc. 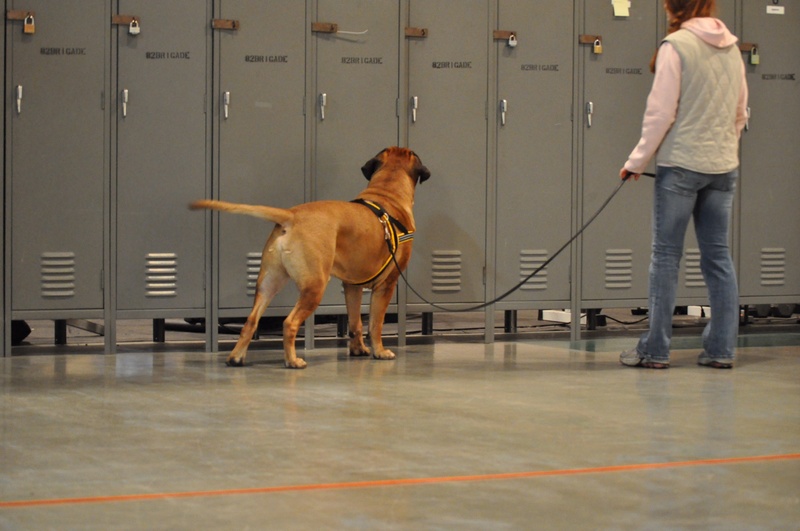 Interior searches are the most fun because you can usually let your dog go searching off-leash. 4) Vehicles – a group of 3 vehicles (or more in higher levels) not limited to cars only. It could be trailers, motorcycles, boats. The dogs search only their exterior. There are 3 different levels. NW1 has only one target odor (birch) and there is only one hide per element. NW2 adds on another odor (anise) and there could be up to two hides per element. It could be either birch or anise or combination of both. NW3 is the highest and the most difficult level. Besides adding the final odor (clove), the handlers don’t know how many hides are put out in each element. It can be one, two or three. The interiors might also include an empty room. The third level is, I think, challenging more on the handler rather than the dog. The dog is doing the same thing it’s been doing in the lower two levels. It is the handler who has to know how to read his or her partner to have enough courage to call the number of hides. So far, 6 Bullmastiffs in the entire US have titled in NW1 and 4 of them are loved by the CNBC’s members (Pippa & Jill, Tonka & Andrea, Maestro & Carrie and Logan & Kelley). 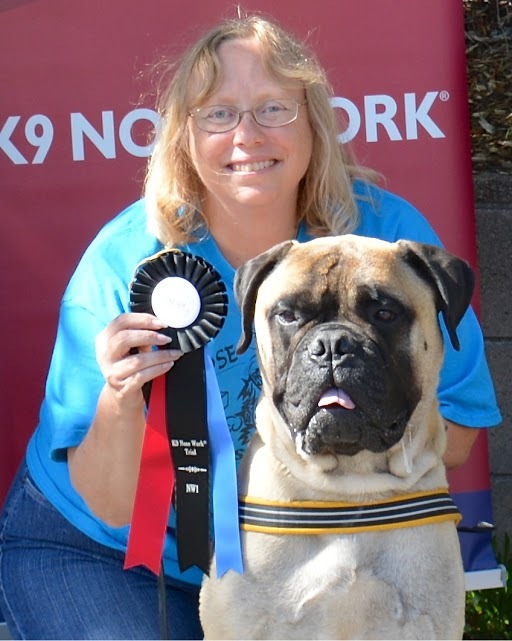 Only one Bullmastiff team so far has obtained the NW2 title, and that is Pippa with Jill Roman. All that said, Nosework is not only about competing. You can play with your dog without ever going to one trial. In classes, only one dog runs at the time, making it the perfect sport for shy or dog-reactive canines. It’s also great for senior or handicapped dogs. One thing I like about it is, that you can practice indoors on a rainy cold day, and the mental stimulation really wears out my unusually high energy Bullmastiff girl. More information about Nosework, including list of certified Nosework instructors in your area, can be found on www.nacsw.net. Check out this Trophy for Ridgefield! Sponsor a trophy today online! • Side door allows flexibility so dog crate can be placed in the most convenient location. • Great for housebreaking - keeps your puppy from eliminating in one end while sleeping in the other. WELCOME to the Cascade Northwest Bullmastiff Club Web Hub! We are proud to introduce our newly designed web services. If you are seeking information about the breed, please feel free to poke around, read, and use us as a resource. For Bullmastiff Fanciers, please visit our store to purchase catalogs, raffle tickets, trophy sponsorships and donations for our specialty shows in December and June. For CNBC Members, we offer exclusive web services that are designed to provide health, behavior, performance event and conformation resources that are a benefit of your membership. Visit our Members Only pages for articles and information tailored to meet your needs. 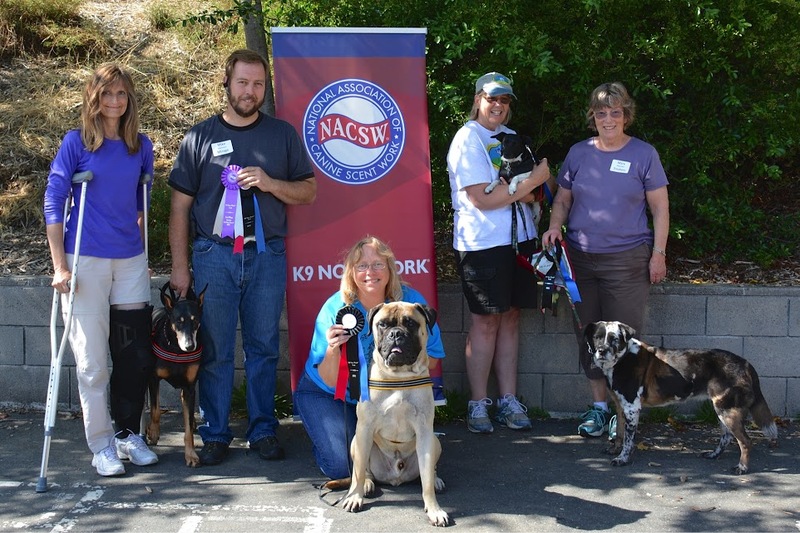 The Cascade Northwest Bullmastiff Club has long had a dedication to providing information and resources for Bullmastiff Fanciers. We are able to do that now with the help of Marie Lambert Business Development. Marie has created a resource designed to provide information the way we get it in the 21st century. You can subscribe, browse, check our Facebook page - you name it and keep up with CNBC in the same way you do all your social media today. THANK YOU MARIE for making this resource possible! On behalf of the CNBC Board and Members -- WELCOME and ENJOY! WELCOME! We (CNBC) are embarking on a new journey. We have entered the bold new world of technology. Technology can be exciting and fun. Technology can also be daunting and frustrating. I am here to help. There are NO stupid questions. If you find yourself becoming frustrated while using any part of our site: Please email me admin@bullmastiffnw.com (include the issue, your phone number and a preferred time to call) and I will CALL you back to help. TO THE PUBLIC: The CNBC Spotlight is currently open for all to see. As of December 31, 2013 it will become a “MEMBER ONLY” area. We welcome all to join our community. Please see more about Membership on the Join US page of this site. Our website will continue to evolve and improve as we all learn to utilize new features. It is with great pleasure I present your new site and THANK YOU for the opportunity to serve the Cascade Northwest Bullmastiff Club.